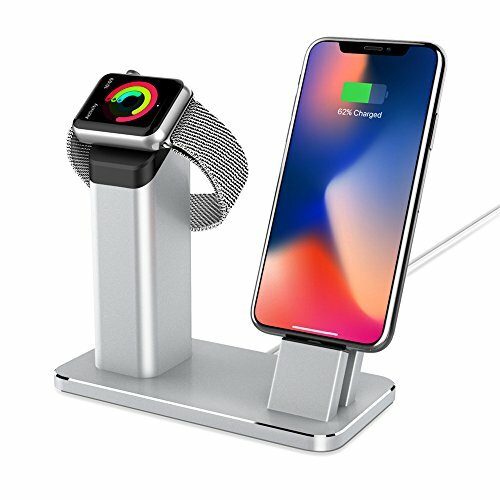 Yootech 2 in 1 Charging Dock is finely crafted from durable aluminum, which is solid enough to support the Apple watch and iPhone when charging in a steady way and provide a comfortable viewing angle. Not only does it allow you for better magnetic charger head placement but also offers great organization for the cables. iPhone Charging Stand supports your iPhone with different thickness case when charging. Which series apple watch does it apply to? Specially designed for all versions of the Apple Watch SERIES 2 and Apple Watch SERIES 1 (38mm & 42mm). Aluminum stand with TPU headpiece provides a scratch-free dock for your watch and holds the magnetic charger securely. Both angled 45°supports comfortable vertical viewing angle for Facetime and different clip choice to offer you a easy charging time without the hassle of taking off your phone case. Note:If your apple watch band is very heavy, please clasp watch band and then put on the stand, it will be more stable. ★WIDELY COMPATIBLE: Universal for apple watch (both 38mm and 42mm), compatible with all Mobile Phones (all size) and iPad MINI. A great ideal when playing devices at charging time. ★UPGRADED SOLID: Upgraded 4mm thickness aluminum can hold devices firmer and sturdier than those 3mm thickness normal stand. Low gravity center, lightweight but solid features keep your worries away. ★ANTI-SCRATCH & ANTI-SLIPPERY: Enlarge anti-scratch silicone pad to offer a better protection of your devices even device case off. Updated coating aluminum alloy material is great to anti scratch. Rear adjustable screw to be compatible with kinds of cases. ★INDIVIDUAL DESIGN: DON'T HAVE TO TAKE OFF iPhone CASES. 6 lightning cable clips and adjustable rear screw to offer you an individual customized Dock for holding & charging your phones. Rear screw is adjustable to be compatible with kinds of cases. ★PACKAGE & WARRANTY: You will get one 2 in 1 Charging Dock, 6 x clips, 1 x User Manner.【Does not include iPhone charging cable, the Apple Watch or Magnetic Charger or Case】. Hassle free Lifetime Warranty, 24-hour response service is friendly offered. At Yootech, ZERO Risk purchase guarantee is for every customer. If you have any questions about this product by yootech, contact us by completing and submitting the form below. If you are looking for a specif part number, please include it with your message.